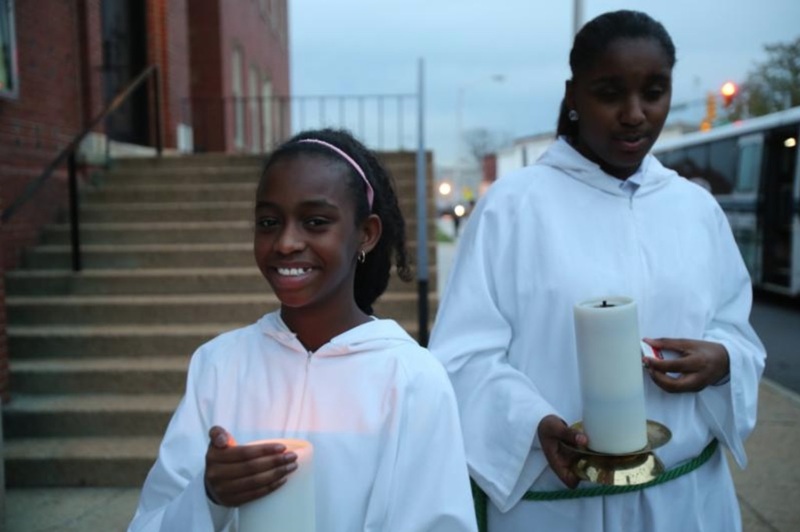 Altar servers stand outside St. Peter Claver Church in Baltimore before Mass Nov. 14. The U.S. bishops’ traditional Mass for their annual fall general assembly was celebrated at the historic African-American church. BALTIMORE (CNS) — The Catholic Church is one of the most culturally diverse institutions in the United States and Catholic institutions and ministries need to adapt and prepare for growing diversity, said a report presented to the country’s bishops Nov. 15. The report, by the Center for Applied Research in the Apostolate at Georgetown University, was commissioned by the U.S. Conference of Catholic Bishops’ Committee on Cultural Diversity in the Church in 2013 to help identify the size and distribution of ethnic communities in the country. Archbishop Gustavo Garcia-Siller of San Antonio, chairman of the committee, called the study “groundbreaking” because he said it combined, for the first time all available data from Catholic and non-Catholic sources and mapped the multicultural and ethnic diversity of the church nationwide. Of the world’s estimated 1.3 billion Catholics, the study found, less than 6 percent live in the United States. Of the U.S. Catholic population: 42,512,591, are white (non-Hispanic); 29,731,302 are Hispanic or Latino; 2,905,935 are Asian, Native Hawaiian; 2,091,925 are black, African-American, African, Afro-Caribbean; and 536,601 are American Indian or Alaskan Native. Of those who responded to the survey, the median age was 52 and considerably higher, 62, for non-Hispanic white Catholics. Latino Catholics conversely had a median age of 39. Another distinction in the report: Catholics born before and after the Second Vatican Council. The report said three-quarters of those U.S. Catholics born before the Vatican II are non-Hispanic white Catholics. And more than half, 54 percent, of what it calls the millennial-generation Catholics (born 1982 or later) are Hispanic or Latino. Many of those have Catholics parents with “little or no experience with the traditional Catholic practices and catechesis,” the CARA statement said, adding that this doesn’t mean they are “anti-religious” yet. Archbishop Garcia-Siller asked the bishops to look at the data, see how it speaks to their regions, and said it could help dioceses plan, set priorities and allocate resources.